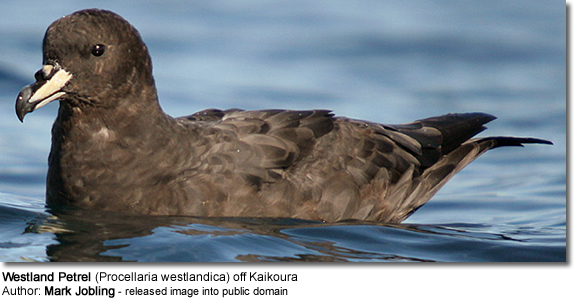 The Westland Petrel (Procellaria westlandica) is a rare seabird that nests in New Zealand's forests. It is one of the largest petrels that nest in burrows, and is threatened by species introduced to New Zealand. 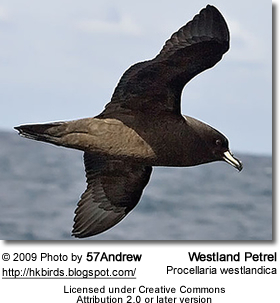 The Westland Petrel is an all dark bird with a yellowish bill and dark legs. It is a large member of the petrel and shearwater family. It has a highly restricted breeding range, currently confined to a small area of the west coast of New Zealand's South Island in an area protected in Paparoa National Park in dense forested hills. 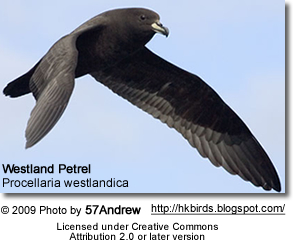 The Westland Petrel is threatened by introduced predators, particularly the feral cat. It is also taken as bycatch by fisheries. Measures implemented by the New Zealand Government and the New Zealand Department of Conservation to control the cats, as well as other predators and other threats to the colony, have gone a long way to protect the species, which is currently stable and in fact increasing in numbers. Should the species begin to decline, however, its small population (2000 breeding adults) means that its classification might need to be changed to Critically Endangered.